Made by Many’s user insights practice helps us to identify new ways to serve and support people with the digital products and services we create and take to market for our clients. One of our key goals as a business is to make digital product innovation more human centred, and user insights are a critical part of the process – continuously throughout the whole product lifecycle. 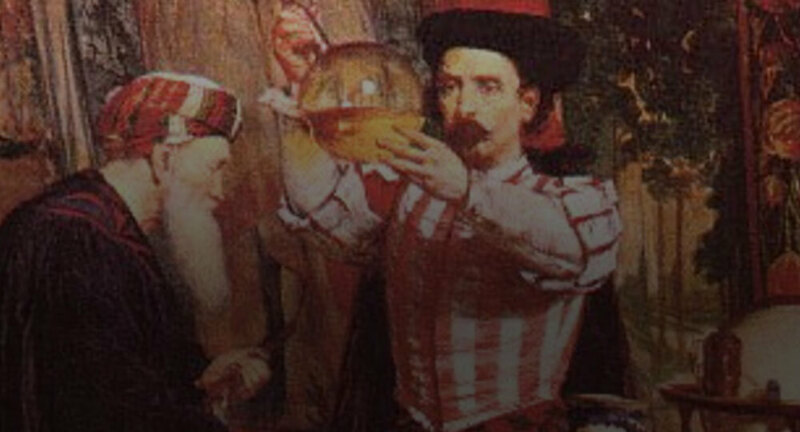 Tim, Tom and Andrew have already talked about our recent launch of School in the Cloud for 2013 TED prize-winner Sugata Mitra, so I won’t go over the background again – this post is a practical guide to the different research methods we used to guide us in the re-design of the ‘Granny Cloud’. We always try to make new products and services with users, not just for them. Again and again, we have seen that this is the best way to ground your own ideas in their needs and behaviours. 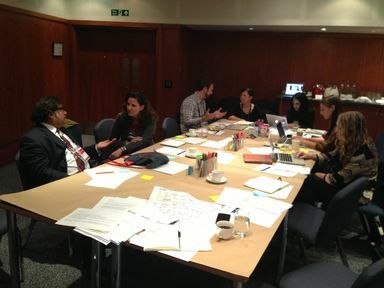 We had lots of stakeholders in this project: the TED Prize team, Sugata and Suneeta (and their ‘Granny Cloud’ and research teams), plus Skype and Microsoft, Newcastle University, and at this stage also IDEO. One of the first things we did was to hold a couple of workshops: one at TED Global in Edinburgh, and one in London a few weeks later. These offered a vital early opportunity to deepen our knowledge of the project, and also allowed us to confirm a shared vision with all of the different partners and stakeholders. Luckily, we also had the collective wisdom of the ‘Granny Cloud’ to tap into. You can think of the Granny Cloud as a human-powered application, held together with bits of tape and run on a shoestring. Nevertheless, Sugata had been running the Granny Cloud for some time and the knowledge contained within these grannies was really valuable. We were able to contact a handful of grannies almost immediately and conduct some interviews. We concentrated on understanding participating grannies’ current experience in the project - what was working/not working; what they enjoyed/didn’t enjoy; what their needs and challenges were. The grannies we spoke to ranged from very active and experienced grannies, to more recent and less experienced in the project. To make these interviews a little more engaging and interactive, we also prepared a small task to do with them during the session. This was a ‘Day-in-the-Life’ activity that involved asking grannies to describe a typical day, from morning to evening, and to describe all the interactions they had on a daily basis with technology and people. This helped them to describe their worlds to us. We were very interested in understanding how their role as Skype Grannies would fit into fit into their daily lives, and how their interactions with technology and the internet were perceived on a day-to day basis. 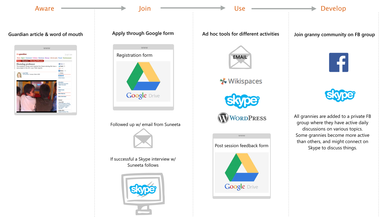 Below is an example output of a day in the life exercise during a Skype interview. After digesting these initial insights from grannies and other key players of School in the Cloud, we felt we had a good idea of what was currently happening throughout the service. But we wanted to check that we’d understood everything correctly, and we also wanted to deepen our understanding. So, we mapped the existing user journey for a new Granny from the time she registers her interest in The School in the Cloud until he or she was running a SOLE session on Skype. This exercise was also useful to illustrate the project to new team members who were joining the project for the next stage. Using all the above techniques we were able – very quickly - to learn a lot about how the Granny Cloud works. There were, however, practical limitations to this and we were keen to experience the reality by observing sessions first hand. We wanted to understand Grannies interaction before and after sessions. So we asked four Grannies if we could ‘sit in’ on their Skype sessions with children in India, in various cases, who had little or no knowledge of the English language. See below for a short clip. This exercise was incredibly valuable and really filled out our understanding of the Granny’s role. It was a great exercise in empathy for us, as these sessions on Skype can be incredibly challenging with quite a few cultural and language barriers. Grannies were feeling overwhelmed having to access at least four separate web services - including a private Facebook group, a private Wiki, Google spreadsheets and a Wordpress blog. The new Granny application process was cumbersome and took a long time to process. The information supporting the process was daunting and not illustrative of the reality of the role they were applying for. 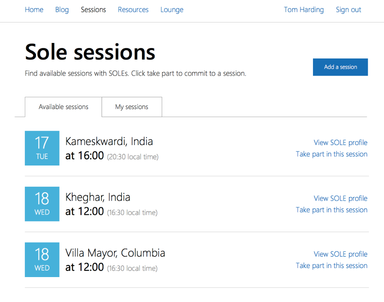 The scheduling and posting of SOLE sessions was manual, laborious and time consuming for all parties involved. 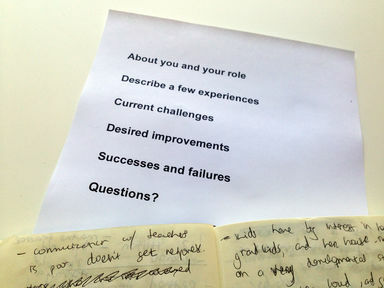 To test the desirability of our recommendations, Tom sketched out a few key user stories to test with the grannies. 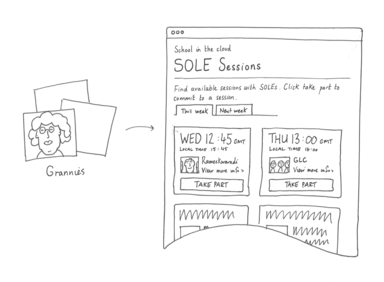 Sketches are low fidelity prototypes, quick to get feedback, low effort to make, easy to edit. We shared these as PDFs over Skype, and walked the grannies through each one. We find it useful to ask questions while we are doing this – for example, did the grannies understand what the improved service is and does? Did people understand how to use it? Did they see the value in it? Could they imagine using it to carry out the tasks they were familiar with? This all sounds straightforward, but the thing to remember is that all of this is happening before we start solving the problem. It is difficult to resist jumping to solutions ourselves (and of course we all have solutions in mind at this stage) but our approach puts the emphasis on evidence rather than ego. We created a simple piece of software within a week so we could start learning from how people used it. Andrew has gone into more detail about how we did this here. It helps at this stage to keep the design deliberately vanilla. Again, this can feel counter-intuitive: the temptation is to elaborate ‘your’ design more than is useful at this stage. The danger of doing that is that you will introduce distractions that compromise the feedback and reduce what we can learn. There is also a risk of waste. The focus should really be on experience rather than look and feel. A growing number of grannies were now using the service we’d built and providing feedback that helped us continuously improve the product. We used this feedback to continuously iterate the design - adding in new features whilst also developing School in the Cloud's brand. We maintained close contact through email and over Skype with a group of around 30 grannies. Some of these grannies had been involved in helping us develop the earliest sketch prototypes, but we also included new grannies as we went along. An additional tool we used was Qualaroo’s a to ask contextual questions and gather feedback during the early stages of the site. The quality of relationships throughout this type of project should not be under-estimated. We were very lucky to have access to a big community of grannies to speak and test with. They had their own routines, habits and friendships, and we had to be conscious that we were coming into their world and trying to change some of those things. Being respectful of users in these circumstances and keeping them in the loop is very important. Insights gathered from grannies gave us great starting points for solving problems and designing a better service than they were already using, but it is impossible to meet everyone’s individual expectations and important not to be led. The key is consistent and respectful communication. Since the service launched at TED in Vancouver we’ve reached a new stage, where we’re able to observe and learn at a far greater scale. Scale has introduced new constraints: we can’t gather and analyse feedback, or iterate, as quickly as we were, for example - we have to be more considerate in how we communicate changes to the growing number of users. The communication dynamic between our users and us is slightly looser now they’re out ‘in the wild’. Ultimately, our users are the ones who have the experiences, and their perception of value remains more important than ours. Having set the stage, we are still focused on making these experiences richer, more useful and more coherent. We are still learning and we look forward to making many new releases based on what we're observing. 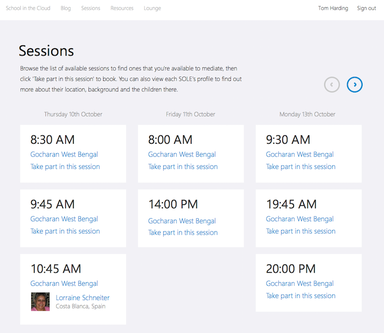 Sugata Mitra’s School in the Cloud continues to be a research project as well as a live service – which makes it almost the perfect exercise in uncovering new opportunities for developing emergent value. A big thank you to the community of amazing grannies, educators and their kids who have been involved in collaboratively designing School in the Cloud from the very start. 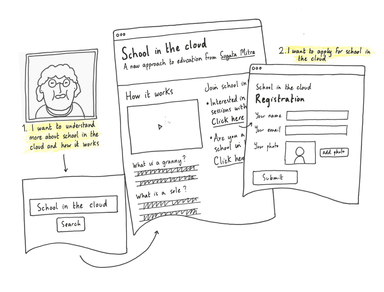 This is a follow–up to our post about launching School in the Cloud at TED2014, with a focus on the design approach we took.